THIS MONTH, I want to continue the discussion on the topic of playing position on balls hanging in the jaws of a pocket. In last month's column, I talked about getting familiar with the different angles that the cue ball can take after hitting a hanging object ball. It's important to have an exact contact point on the object ball, so you can have a precise plan for the cue ball after contact. This month, I want to focus on shots where you will need (or want) the cue ball to go off the rail before hitting the object ball into the nearby pocket. To start working with rail-first shots, set up the shot shown in Diagram 1. But before you try to pocket the 1 ball, put another object ball where the ghost ball would be (the dotted-line ball in the diagram). By placing a ball exactly where the cue ball needs to be when it hits the object ball, you making it easier to visualize the shot. Work on finding the right contact point on the rail that will allow you to successfully pocket the 1 ball. The next thing you want to focus on is playing position for your next shot. It is imperative that you ask yourself how you want to hit the object ball. 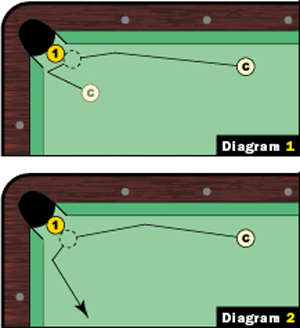 A thick hit (shown in Diagram 1) will slow down the cue ball. But a thin hit, like in Diagram 2, will leave the cue ball with plenty of speed after contact with the 1. Comparing the two shots, there is only a small difference in the location of the object ball at impact with the 1. But even the slightest change can spell big differences in the cue ball's speed and angle after contact. When you are able to control the type of hit on the 1 ball, you will have many more options for cue-ball position on your next shot. Keep working with different rail-first shots. You should be able to build up your confidence to the point you feel comfortable sending the cue ball off the rail and into a hanging object ball.